Most people would be shocked to learn that much of what the mainstream church teaches and practices looks nothing like the practical faith of the New Testament believers. What are the differences and how did those foundations get altered? And while the rapidly growing Hebraic Roots Movement purports to correct many of those unscriptural changes that occurred, is it doctrinally trustworthy, or is it heresy that attempts to place believers under the Law of Moses? Be prepared to be moved out of your spiritual comfort zone as From Christian to Believer pits the truths of the Spirit against the traditions of men, and exposes the differences between the two. 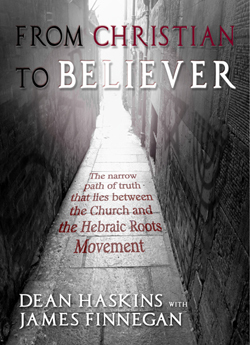 This book shines light on the narrow path of truth that exists between the church and the Hebraic Roots Movement, and exposes errors that exist on either side of it. A brief history that examines Constantine's role in altering the true foundations of the faith, and obscuring the traditions and identities of the Father and the Son. An overview of both the physical and spiritual meanings of the feast days, with a detailed look at the individual elements of the Passover Seder, and their spiritual meanings. A specific look at Christmas and Easter, and a detailed explanation of Christ's birth during the Feast of Tabernacles, His death at Passover, His burial during the Feast of Unleavened Bread, and His resurrection on the Feast of Firstfruits. Chapter Four – Do Sinners Go to Heaven? A further exploration of the previous chapter with more detail about the sins of the flesh and how they determine relationship (here) and heavenly reward in eternity. How the written law of Moses applies to unbelievers, or those who are spiritually dead. How the written law of Moses applies to believers; specifically, how the written law foreshadowed the Holy Spirit, and how He is the spiritual real substance of the physical symbolism of the written law. This chapter examines Christ's words in the Sermon on the Mount as they apply to the physical governance of the written law vs. the internal governance of the Holy Spirit. Chapter Nine – Are Pigs an Abomination? A look at the specific admonitions regarding pork, what they mean, spiritually, within the life of the believer, and how those who claim to be “Torah-obedient” deceptively twist the meanings of the scriptures that apply to those truths. Chapter Ten – What Is Unclean? A further examination of the spiritual application of “unclean,” as opposed to the physical symbolism used in scripture to portray that spiritual truth. More of the common heretical teachings of the Hebraic Roots Movement, and the tactics they use, such as the misapplication/misinterpretation of scriptural texts, and the deception of changing the very words of scripture. By extrapolating the Temple Ordinances and Practices as they apply to the barley, wheat, and grape harvests, the Pre-Tribulation rapture of the bride can be seen vividly. As with the biblical harvests, understanding the correlation between the ancient Jewish wedding traditions and eschatology, the Pre-Tribulation rapture of the bride can also be seen in those traditions. Chapter Fourteen – Is the Bible the Word of Yah? A brief examination of who the Word (Hebrew: dabar/Greek: logos) is, and an explanation regarding why the Word is not the Bible, but that the Bible contains words that were inspired by the Word (logos). Chapter Fifteen – Is Scripture-Alone Sufficient? Continuing with the understanding of WHO the Word of Yah is, this chapter examines the error of Sola Scriptura, and the difference between physically understanding scripture, and understanding it spiritually, which only comes through the instruction of the Holy Spirit. Chapter Sixteen - How Do You Know You Are Saved? An examination of what scripture actually teaches regarding salvation, and how those truths are contrary to what is taught by so much of the church, with a focus on the Passover element of the haggadah, and how that foreshadows the reality of salvation. A continuation of the doctrine of salvation, with an explanation of the period between one's belief (which is a person's proper response to the drawing of the Holy Spirit), and salvation (which is the Holy Spirit's response to a person's belief). Chapter Eighteen - Did Christ Speak in Tongues? A brief explanation of the gifts of the Spirit, and the reason neither Christ nor John the Baptist ever spoke in tongues. Chapter Nineteen - What's in a Name? An overview of how and why the names of the Father and Son were changed, as well as the name for the “called-out assembly” (Hebrew: qahal/Greek: ekklesia). Chapter Twenty - Do All These Things Really Matter? Why these truths are so important for believers, the purpose of the second Passover (and what it foreshadows), what the seventh-day Sabbath foreshadows, and the reasons to conclude that the time of Gentiles is quickly drawing to an end.